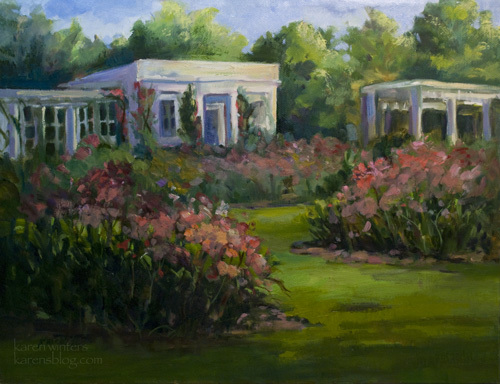 Unless someone claims it before next weekend, this painting will be among many others for sale at Descanso Gardens in the Rosarium, April 18-19 from 9am to 4 pm. Each of Descanso’s featured artists has been invited to bring 6 rose-themed paintings for display … and many of us will also be in the rosarium painting in the garden. I will be there all day Saturday and until early afternoon on Sunday, so if you’re in the area, please stop by and say hello. I’m probably going to be leaving Sunday around 2:30 because I have a workshop I’m attending the coming week. 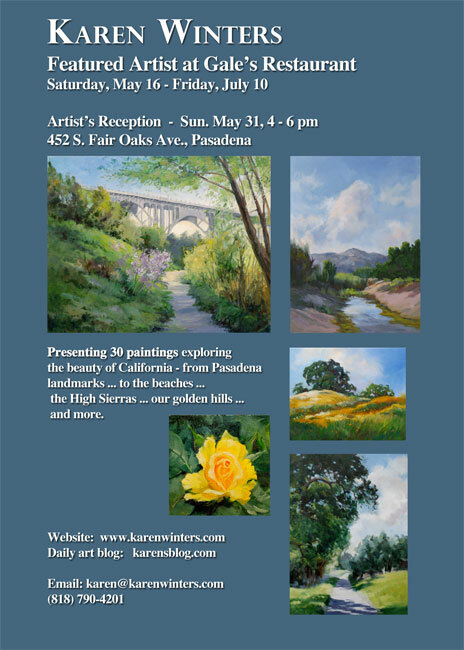 But my paintings will remain at Descanso until the show closes. 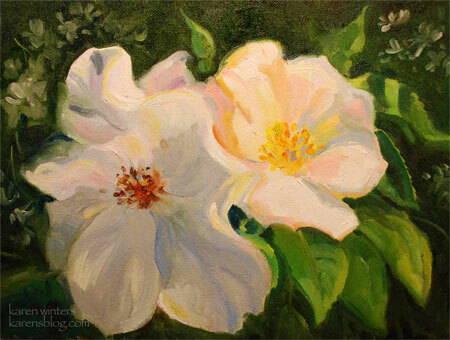 This painting features what I believe are grandiflora roses. I didn’t see a tag but I’m going to guess that they are the AARS 2008 rose of the year “Dream Come True.” The interior is yellow but the outside of the petals are a magenta which looks red under warm light and more pinkish blue in the shade. 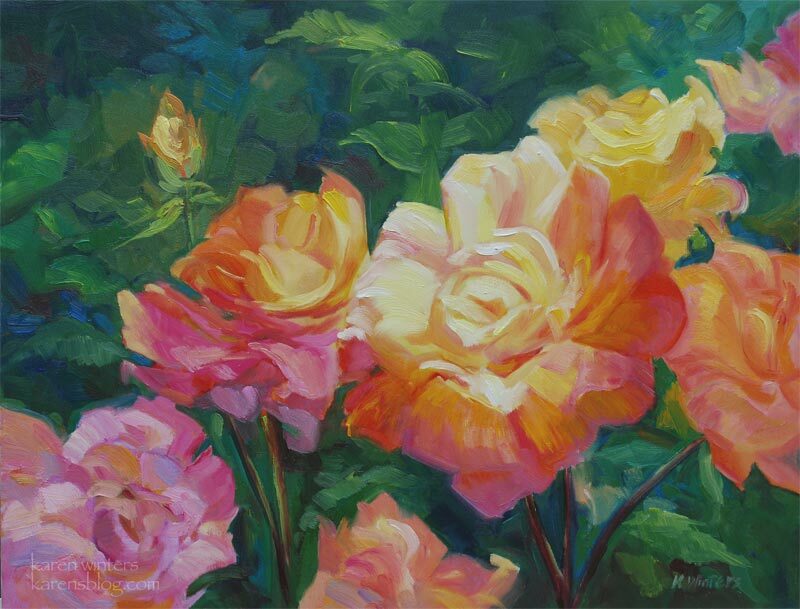 Because you know how I feel about color (and lots of it) I opted to use the full range of colors that these beauties reveal, showing some of them spotlighted by the sun, and painting others shyly bluish in the shade. I’m hoping that someone will find a place for it in their dining room or a sunny bedroom. This year I added three new roses to my garden: Traviata, Christian Dior and Radiant Perfume. It will take a while for them to bloom, but look for their sunny portraits here in coming months. 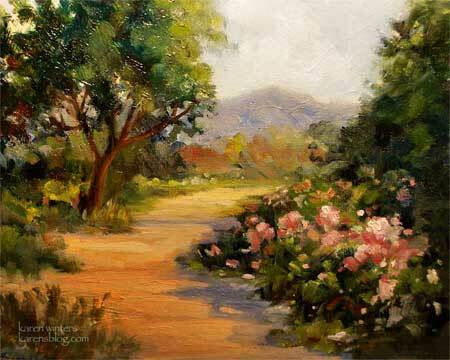 On the occasions that I paint in pastel, I mostly do landscapes. 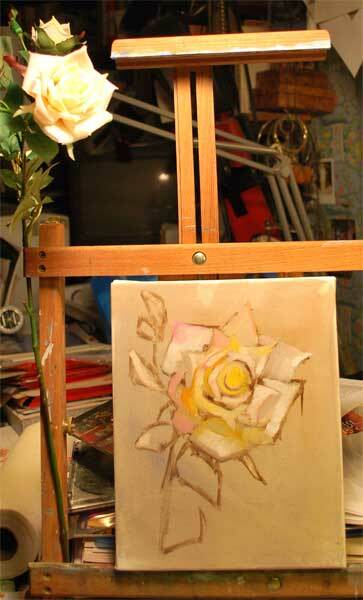 But I thought it would be an interesting experience to do a study of a rose using that medium. In retrospect, it might have been a little easier if I had worked larger, but I was mostly just having a good time, experimenting and keeping a loose feeling while enjoying the patterns and complementary colors. I used both hard and soft pastels in this, working my way from the Rembrandts and Holbeins to the Senneliers and Unisons. 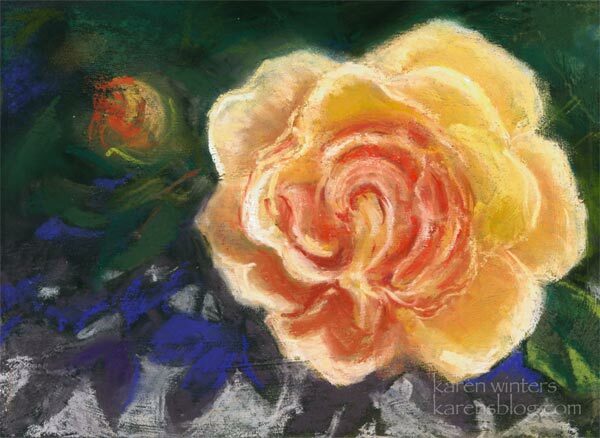 The rose is an old rose in the Descanso Gardens Rosarium. The Sunday show in Malibu was a really fun event. 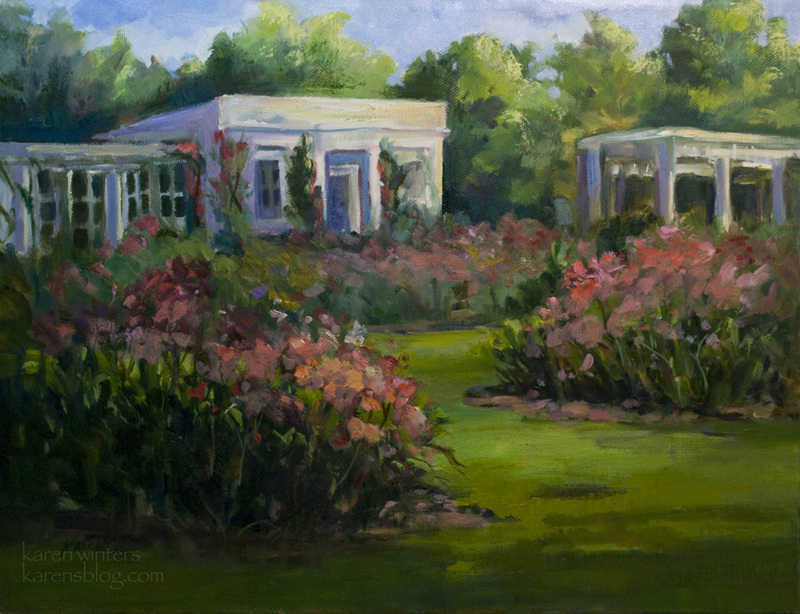 Not only did one of my landscapes (a pastel) go home with a new collector, but I had the pleasure of meeting a lot of new people who expressed interest in seeing more of my work, something very nice to look forward to. 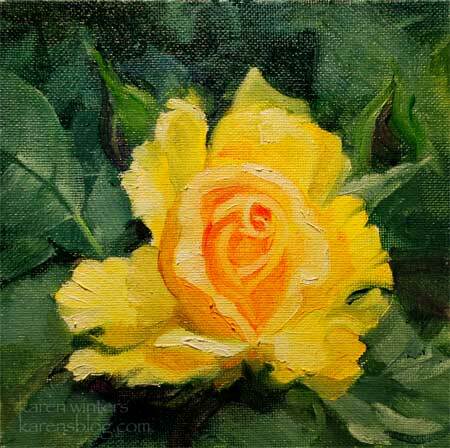 Here’s another in my rose series – this time a close up in a more realistic style. I love impressionism, but I wanted to challenge myself to do a more realistic painting from life, and this was the result. 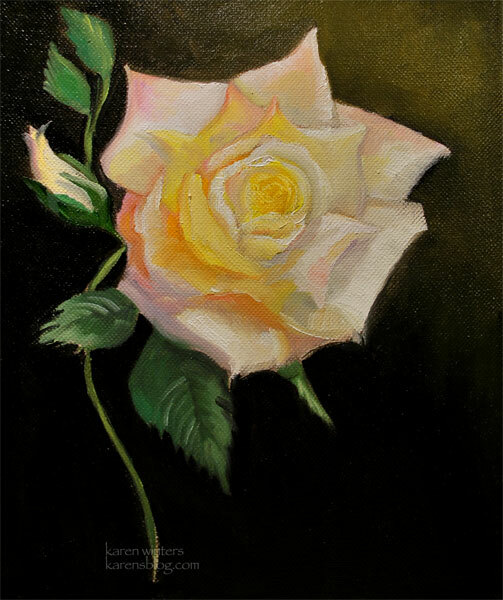 My mother was a plant lover and from her I learned the names of all the roses she cultivated: Chrysler Imperial, Love, Cherish, Honor, Peace, Mister Lincoln, Queen Elizabeth, Sutter’s Gold. Each colorful name brought stories to mind. When I visit the Descanso Gardens Rosarium and look at the labels of the roses in bloom, it’s like seeing old friends … ever new, ever fresh, ever young. Below: starting this painting on a toned canvas. If it’s not too late, I’m going to head over to the nursery today to see if they still have a few bare root roses left to plant. I do love roses and grow them in my yard. My favorites are Climbing Peace, Just Joey and Sally Holmes. 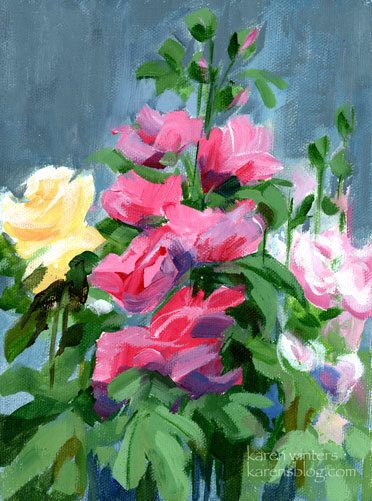 But no matter the variety, every rose delights me and offers creative possibilities. At the Descanso Rosarium, there’s an amazing collection of roses from around the world – from the oldest shrubs to the newest hybrids. You’ll find climbers, rugosas, floribundas and more, intermingled with irises and drought-tolerant perennials that provide additional texture and color. If you are in Southern California in the spring, you just have to see it (and smell it) to believe it. This painting has evolved through the years. 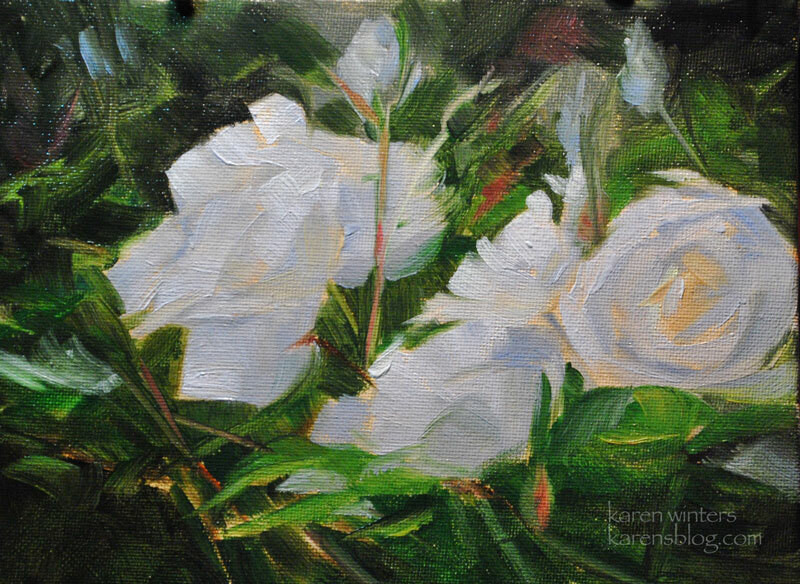 It started as an oil sketch a few years ago, but I put it away, dissatisfied. Today, with a few miles under my brush, I took it out again and revisited the subject. I’ve noticed differences in how I paint certain subjects. I’m more aware of color in shadows, and I tend to paint masses of leaves and flowers rather than just individual blossoms. I’m more likely to change the scene from “what is” to “what could be.” And I am more inclined to simplify and not to put in every bench and bud if it doesn’t add to the composition. The painting is wet so I had to filter it a little bit to get rid of all the distracting specks from the indoor light. When it’s dry I’ll either scan it or take it outside on a non-rainy day and shoot it in light shade or indirect north light. Which is to say, it’s a bit crisper than this. If you’re interested in this painting, please write. My email is at the top left of this blog. Interested in this painting? I’d love to hear from you. These Sally Holmes roses grow in my garden. They’re climbers and love to arch over the little arbor I have that leads to the back yard. Sally is technically a shrub rose, but it is a hybrid of “Ballerina” (a hybrid musk) and Ivory Fashion (a floribunda.) It grows like crazy and is a welcome addition to any garden. I’ll be showing this painting and many others at the Sierra Madre Art Fair on Saturday and Sunday May 7-8, 2011 in Sierra Madre, California in memorial park. Please come!